New Frontier Tiny Homes + DIY Network's "Tiny House Big Living"
Tiny homes have been on everyone's radar for the past few years, so when New Frontier Tiny Homes approached us about collaborating on a tiny home project here in Nashville, we instantly said yes. New Frontier Tiny Homes is a company that designs and builds tiny homes for people looking to make a lifestyle change, to make a smaller environmental footprint and to own a home without the hefty price tag that often comes along with it — and those are all ideas that we can get behind. We love that they put a big emphasis on both the beauty and the function of the design, as well as the quality of the materials that they use in each of their builds. 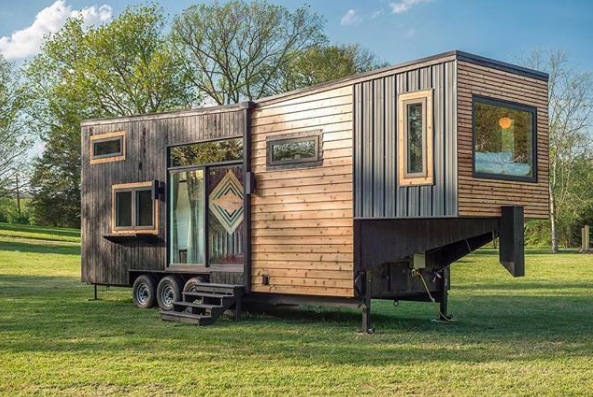 We worked with NFTH to build the Escher Tiny Home, which is one of their newer design plans. We installed a custom 1767 art installation on the door to the home, as well as a 10-foot wall installation inside. Once the project was completed, we were even more thrilled to learn that it would be featured on DIY Network's Tiny House, Big Living. The episode will air on Thursday, August 24 at 8 p.m. CST, but you can watch it on DIY Network's website soon after.